A major volunteer effort led by Friends for Rivers will take on the challenge of cleaning up the Guadalupe River from Canyon Dam to Lake Dunlap, the entirety of the Comal River, Lake Dunlap, and portions of Landa Lake on September 19, 2009. The event will feature T-shirts, free camping on September 18 and 19, prizes for most trash collected and most unusual trash collected and a celebratory bonfire on Saturday night for participants. There's a fee of $2 per person to participate. This clean-up requires advance registration and detailed information from participants concerning their capabilities. The Friends for Rivers site has the details. There is also a major parallel Boy Scout component to the clean-up. The San Antonio City Council has scheduled seven public meetings to discuss the CPS plan to build another nuclear plant. You are welcome at any meeting no matter which council district you live in or whether you live in the city at all. This plan will affect all CPS customers and have an impact on water usage throughout a much wider area. Disposal of the radioactive waste generated by a new plant will affect an even larger area. No matter what your opinion on nuclear energy this is your chance to learn and make yourself heard. Texas Public Radio and the San Antonio Museum of Art are partnering for Contemporary Art Month to showcase the “Waterflow” exhibit, featuring pieces by artists who are inspired by water. The evening kicks off Texas Public Radio’s Focus on the Environment, an annual spotlight on sustainability issues in the community, July 30, 2009 from 6 to 8:30 p.m at The San Antonio Museum of Art, 200 W Jones Ave, 78215. In celebration of the opening of the newly expanded Museum Reach of the Riverwalk this May, SAMA is pleased to present Waterflow, an exhibition of recent works by fifteen Texas artists who have been inspired by water. The exhibition features work in several mediums and takes a variety of approaches, with themes centering on the essence of nature, the passage of time, nature as metaphor, and the preservation of the environment. Guests of SAMA and TPR can enjoy the "Waterflow" exhibit for free and have an opportunity to meet some of the artists whose work is displayed. The San Antonio Water System, the San Antonio River Authority, The Edwards Aquifer Authority and the Texas Water Development Board will be on hand to educate visitors on conservation of San Antonio's most precious resource. Activities include a blind taste test to see if you can determine which water comes from a bottle and which comes from tap water. Visitors can also listen to Handel's "Water Music" and other classical selections, courtesy of Brass FX, or enjoy the banks of the San Antonio River at the Museum Reach of the Riverwalk. The evening will also include food from Water Street Oyster Bar. Join us on Thursday, July 30 at from 6 to 8:30 p.m. for a family-filled evening of art and environmental awareness. If you are not a member of Texas Public Radio, you can join at the event and receive our TPR logo water bottle. Visitors who join SAMA that evening will receive a full-color booklet about the "Waterflow" exhibit. This event is free and open to the public, however, reservations are required. Waterworks is made possible by the San Antonio River Authority and the Edwards Aquifer Authority. You are invited to come to the monthly meeting of the San Antonio Sustainable Living group on Tuesday, July 28th starting at 7pm in the classroom at Whole Foods Market in the Quarry Shopping Center. This month's topic will be on Timber Frame construction. Most are familiar with the standard residential construction using light wood framing of wood studs, joists, and trusses. Timber Frame construction is made from much larger wood posts and beams. When designed correctly, timber frame construction uses less wood than conventional light wood framing. Wood can be provided by sustainable harvesting methods that is documented by third parties to determine the amount of lumber removed from an area for production does not exceed the amount of wood that grows in that area during the same period of time. Heavy timber construction is very durable and allows for a variety of high performance materials that can be used as the "skin" of the building. There are many different types of framing that can be used in the broad category of heavy timber. We will have a representative from Texas Timber Frames appear to give the presentation, and hopefully hear from Sand Creek Post & Beam as well to present a similar option of timber frame construction. Update: Here is a link to a series of YouTube videos of our July meeting by OrganicTexas. Green Spaces Alliance in voting contest for $25,000 to fund 3 community gardens in low income neighborhoods. Green Spaces Alliance needs your help to obtain a $25,000 grant which will fund the establishment of 3 community gardens in low income parts of San Antonio. The alliance is a one of 10 finalists in a contest sponsored by Markham Vineyards of Napa Valley. From now until August 24, 2009 you can vote once every day for one of the finalists. The top two vote-getters will receive $25,000. Right now, Green Spaces is in fifth place and in need of a push. Green Spaces has a track record of achievement, this grant would do San Antonio a world of good. The sale of Floresvillle organic milk producer, Dr. James R. Leininger's Promised Land Dairy, on July 19 to a division of Grupo Lala of Mexico, raises the question as to who owns other industrial organic food companies. That question is answered well by a chart produced by Phil Howard, assistant professor at Michigan State University. The chart entitled "Organic Industry Structure: Acquisitions by the Top 30 Food Processors in North America" is found on the website of The Cornucopia Institute, a Wisconsin based institution involved "in educational activities supporting the ecological principles and economic wisdom underlying sustainable and organic agriculture." The chart shows the ownership of a number of major industrial organic brands by food processor powerhouses including Kellogg, General Mills, ConAgra, M&M Mars, Pepsi, Coca-Cola, Kraft and Nestle. Do you really want your home to last hundreds of years (or even fifty)? Open Building concepts can make it so. A builder of stabilized compressed earth block buildings tells his students that such buildings will last 2000 years. A designer/builder trained in Europe notes that houses in Germany with 100 year mortgages are meant to last for centuries. Many green and natural builders strive to make homes that will stand for generations and look with dismay on the homes that dominate our cities and suburbs which have an estimated life span of perhaps fifty years or less. But an element of home design that is almost always overlooked to one extent or another even by green builders is “Open Building” which is necessary to make a structure last and stay useful for one generation or several, hundreds of years or a millennium or two. “Open Building” as it applies to single family homes means, in part, that the systems of the building are kept from tangling with each other and are easily accessible without destruction to other systems so that they can be replaced and reconfigured as they age, as the needs of the occupants change and as technology advances. Even in green built buildings wire is buried inside walls. A metal conduit in an compressed earth block wall won’t last the 2000 years the wall may last. Water and waste pipes hidden are not likely to last 50 years. “Open Building” has been applied for a number of years in large apartment blocks in countries around the world. As described by Stephen H. Kendall and Jonathan Teicher in “Residential Open Building” (available to many as an e-book through NetLibrary and in a limited form from Google book search), the word “support” means the support systems of the individual apartment: HVAC, Electrical, Water, Waste, Natural Gas. The word “infill” refers to finish-out of the individual apartment. Tedd Benson, founder of Bensonwood Homes, a pioneer of residential open building for single family homes in the United States refers to the infill and support as “layers”. Layers include: Structure (the load bearing walls or framing), Skin (the siding, windows, roofing and insulation), the Space Plan (interior wall configuration and the size, number and use of rooms), Plumbing, HVAC, Electrical and Stuff (the furnishing). Some layers are longer lasting than others. Some need to be updated or repaired more frequently than others but no layer remains unchanged forever, nor is any layer likely not to need to be repaired. In the USA we are most familiar with something similar to “Open Building” in commercial office buildings and retail centers in which the builder provides an enclosed space with access to the HVAC, adequate electrical lines and waste pipes and so forth while, the lessee hires contractors to finish out the space to their specifications. When a tenant leaves, the new tenant may retain all or part of the finish out, or they may strip down the space completely and start fresh. Although a great deal of unsustainable waste is generated by this frequent reconfiguring and redecorating to suit the whims and egos of corporate officers, the fact that the spaces can be completely reconfigured without destruction of the entire building is an advantage in sustainability. An “Open Building” commercial space goes far beyond the standard American commercial model though. “Open Building” buildings and spaces are designed so that each of the support systems could be replaced and updated without affecting the other systems. Without open building we see commercial building after commercial building razed and sent to the landfill, a process that is certainly not sustainable. In “Open building” apartment blocks, the lessees or purchasers of the individual apartments are enabled to configure their apartment in ways that meet their needs and desires. This reduces alienation, improves the well being of residents and increases their ability to live as they choose rather than being locked into a master design. This process would particularly lend itself to American co-housing developments. An “Open Building” single family home can serve for generations and in the vision of Stewart Brand, learn. When family needs change or when the neighborhood changes from suburban to urban, from residential to office and back again, the internal walls of the building can be reconfigured without affecting the integrity of the structure. An “Open Building” building from 1860 (if there were such a building) though it were built in the days of oil lamps and coal or wood cooking would have seamlessly allowed for the introduction of gas lighting and cooking to be followed by knob and tube wiring to be followed (unfortunately) by aluminum wiring, which would in turn be replaced by romex, updated by various fire preventing code improvements and which will no doubt be replaced in coming decades by some other advance in technology. Yet how very difficult these improvements are to incorporate into our existing homes. How much expense beyond the new systems themselves goes into installing them in our homes whether the house is 50 years or 10 years old. In an “Open Building” home the expenses for renewing worn systems or updating obsolete ones are minimized. Some aspects of open building for single family homes are simple to envision: accessible chases for water, HVAC and electricity and data so that each system can be replaced, repaired or altered. But other aspects of open building are more subtle. Tedd Benson suggests “plug and play” electrical connections, crimped copper plumbing unions, quick connect manifold valves and compatible interchangeable house parts. He points out the advantages of timber framing (which his company uses) for open design, though the framing is only part of the open building design they follow. You can learn more about open building at http://bensonwood.com/innovation/. There’s an excellent story from the October/November 2006 Fine Homebuilding entitled “Reinventing the House” by Andrew Dey. You may be able to find it on the web or if you subscribe to the magazine you can have access via Finehomebuilding.com. Stewart Brand’s book, How Buildings Learn, served as an inspiration to Tedd Benson and convincingly shows that houses are not static structures. Mr Brand did a BBC Series based on his book and has now made it viewable on Google Video. Though its subject is open built mass residential housing, Residential Open Building by Stephen Kendall and Jonathan Teicher has valuable background on the bigger picture and philosophy of open building. Bensonwood Homes’ white paper “What is Open Building” may be found on their site and downloaded. It makes the case for open building and shows they have registered "Open-Built" as a servicemark which is why the less attractive term “Open Building” has been used throughout this essay. Open-building.org has a number of resources available, though their emphasis is mass housing development rather than single family homes. Perhaps in the future sustainable open building will be the norm, reconfiguring and updating our support systems will be simple and our homes can last (with periodic renewals) for centuries. But for now it is up to the individual contractor, designer, architect and homeowners to seek out information on open building and advocate that the evolving concepts of it be incorporated into the structures, much as they have made the case for other aspects of green and sustainable construction. Below is part 1 of Stewart Brand's BBC program, "How Buildings Learn" directed by James Muncie with music by Brian Eno. Has it ever the thought ever sprung into your head that it would be nice to share the land you have with somebody who likes to garden, or if you don't have land that it would be nice to use someone else's land to garden? It certainly has come up at our house. Liz McClellan, who lives in Eastern Oregon has created a site, Hyperlocavore, to allow you to connect with people near you who either want to garden but don't have land or who have land they want to share with people who want to garden. It is a way to enable you to set up your own tiny community garden or perhaps a variation of a CSA except that the community in CSA would be right in your neighborhood. The site operates on a social networking model. Here's a link to an audio interview done by About Harvest. As of July 23, there are five members in San Antonio, (at least 25,000 elsewhere)so for it to work more people will need to join, but it is free and it seems like a good execution of an idea that fills a need, so here's hoping it takes off. About Harvest has produced two very interesting short documentaries about the industrial production of berries. NJ's Red October tells the story of the introduction of water harvesting of cranberries. It is being shown at film festivals and private screenings for the time being. The Mighty Humble Blueberry tells how Elizabeth Coleman White and Frederick Vernon Coville tamed the wild blueberry for commercial production. It is now available for purchase from Amazon. You might also check out their sister website stories about food which has more information relating to local food in general and local New Jersey food specifically. John J. Moroney's exploration and analysis of an updated version of the ancient dirt roof of Mexico shows that it is an economical and high performing alternative to both standard roofing and to high tech European inspired green roofs. He has generously given his permission to post his study here. I have broken up larger paragraphs for easier online reading. Some of the graphics may not be clear in this blogged version. Mr. Morony is not responsible for any errors in this presentation of his work. Please contact Mr. Morony for a copy of his study in its original format. The green roof movement, originating in Europe, is well established in North America but with no mention ever made of an ancient antecedent, the Mexican green roof. The green roof movement is mainly concerned with large commercial and public buildings while the Mexican green roof is associated with adobe dwellings. The Mexican green roof: 1) protects the major roof components from climatic extremes of hail and fire; 2) latent heat flux of the soil serves to stabilize temperature at the decking providing insulation. Data suggests that 8 inches of soil on a Mexican green roof is an equivalent to an R-30. Additional insulation is possible by being emplaced directly on top of the decking and below the waterproof membrane. With an adobe dwelling, the roof decking also serves as the ceiling and generally remains close to the indoor temperature regardless of outdoor ambient conditions. The decking of a contemporary type roof may exceed 150° F in the heat of the day while the decking and membrane of a Mexican green roof, under the same circumstances, may have a temperature less than 80° F; a temperature difference of 70° F between the decking of two roof types. The life span of green roofs exceeds many contemporary type roofs by a factor of 3 or greater. In New Mexico, a return to the Mexican green roof would resolve the roof problems of buildings affecting a Santa Fe look. It would improve the flat roof, from one of the most climatically vulnerable, to one of the most durable in addition to all the other advantages. The Mexican brown or dirt roof, capping adobe dwellings, is a vernacular architecture of the arid and semiarid region of Mexico and parts of the southwestern United States, especially New Mexico. It has persisted for at least the past two centuries. However, the Mexican brown roof (if without vegetative cover) may become a green roof once weeds and grass are established thus I will refer to is as the Mexican green roof. In any event, the Mexican green roof bears no connection to the current green roof movement. Of the now significant corpus of literature on the European green roof I have yet to find any mention of the Mexican counterpart. Originating in the German speaking countries the green roof movement is now well established in much of Europe and has taken root in parts of the United States and Canada; and for good reason. The green roof movement is a well considered architectural solution to two major urban problems associated with large commercial and public buildings: 1) abatement of storm water pour-off and, 2) the reduction of the heat island effect. Both problems result from extensive use of concrete and asphalt. In some instances large urban areas are reported to have temperatures 10°F above the surrounding rural area. By absorbing significant rain water, the green roof slows and lessens rain water pour-off into streets and drains while vegetated roofs greatly reduce surface temperatures. However, the Mexican green roof has been restrict-ed to adobe dwelling for what are presumably practical reasons but none of which are a major concern the two urban problems just mentioned. Be that as it may, the urban green roof and Mexican green roofs share important similarities. There are two types of urban green roofs; intensive and extensive. The intensive green roof, with garden-like vegetation, is developed on thick soil substrates and generally restricted to small areas. They will not be discussed further. Extensive green roofs are relatively light weight and may be as little as 4-inches thick with specially selected vegetation. They are intended to cover expansive roofs of large public and commercial buildings and they are what is most often thought of as an urban green roof. The Mexican green roof is in between the intensive and extensive types in that the soil depths are generally much thick-er (8 to 16-inches) than for the extensive green roof but with little concern for the nature of vegetative cover. However, what ever the difference in intended function both the urban and Mexican green roof share common properties distinguishing them from conventional type roofing. Vegetation, considered an essential component for the urban green roof, tends to small succulents that are dominantly C4 or CAM plants. Such desert type plants may be very drought resistance due to specialized adaptations associated, in part, by severely limiting transpiration during the day. The leaf pores (stomata) that allow carbon dioxide to enter and oxygen and water vapor to exit are closed during the day. Emphasis on roof vegetation is a major difference between the European and Mexican green roof where presence or absence of roof vegetation is simply fortuitous. I know of no instance where vegetation is deliberately cultivated. I suspect that the gains with soil on the roof are so significant that the additional effort required to maintain a vegetative cover are not deemed to be worth the effort. However, some gain with vegetation is possible with the use of C4 plants, where the pores remain open and transpiration of water vapor may be vigorous during the day. Transpiration is what is associated with evaporative cooling with plants. However, C4 vegetation requires watering during dry periods but one can anticipate significant evaporative cooling during plant transpiration. For this reason a C4 vegetation may be best for a Mexican green roof. This subject of appropriate vegetation for a Mexican green roof needs more study. 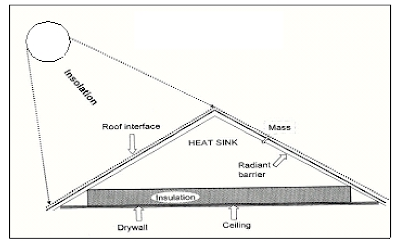 CONVENTIONAL ROOF (Figure 1) Roof surface and decking subject to climatic extremes of temperature, ultraviolet rays and wind. Subject to destruction by severe winds, hail and fire. Short roof life span. Insulation restricted to interior temperature controls only. No protection provided roof. Radiant barrier utilized in most instances. 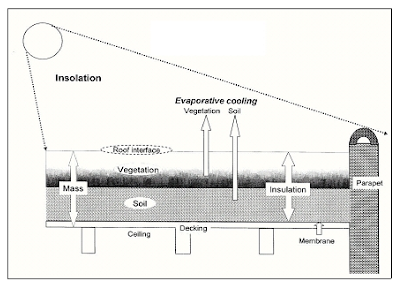 MEXICAN GREEN ROOF (Figure 2) Vegetation + soil serves as insulation and protection to major roof components of decking and water proof membrane. Decking and membrane experience very minor temperature fluctuation and are completely protected from solar radiation and weathering. Additionally, evaporative cooling from soil and plants, when present, serve to lower temperature of the green roof. Wind advection neutralized by vegetation when present. Green (living) roofs continually regenerate with minimal care. Roof components may last up to 100 yrs. Significant mass provided by soil and vegetation, serves to stabilize deck/ ceiling temperature. No requirement, or functional role, for a radiant barrier. Figure 2. Mexican Green Roof. The profuse vegetation illustrated on the roof is very much an exception. Depending on location, as in non-arid lands, some vegetation can be expected in most parts of the year in most parts of Mexico. Where soil is not on top of the decking there is a need to have insulation below the decking. Where cold climate requires additional insulation, it can be emplaced directly on top the deck-ing and beneath the waterproof membrane. 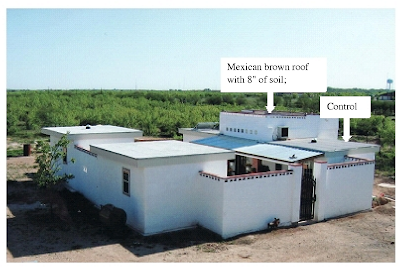 A Mexican „brown‟ roof (no vegetation yet present) was constructed in conjunction with a control for comparison of data. The roof, with 8 inches of soil, rated R of .24 per inch would thus have an R-value of 2. 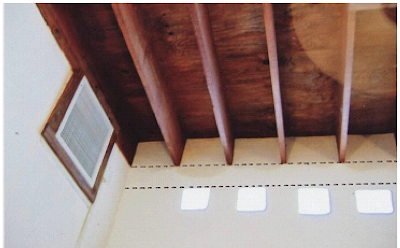 The room with the conventional flat roof has rock wool insulation of an R-30 rating (Figure 3). However, the ceilings of both rooms varied but 1°- 3° F of one another regardless of fluctuations of outdoor ambient temperature, summer or winter. In effect, the brown roof, without a vegetative cover, acted as an equivalent of R-30 insulation. The explanation is that, as the dirt roof contains clay, there is latent heat of vaporization taking place when the RH fluctuates. Should a grass cover be well established on a Mexican roof, at least to the extent that sunlight does not reach the soil surface, the temperature of the decking/ceiling could be reduced significantly when ambient temperature are the highest; at least in theory. With a 100-degree ambient temperature in mid-summer, I was able to record temperature in the upper 70s some six inches below the surface of growing turf along the roadside. There remains the question of what effect this would have with respect to the internal ambient temperature? Would it be worth the effort and expense to maintain a vegetative cover? A factor to consider would be the total cubic feet on the internal spaces. The less the volume the greater the potential effect. Figure 3. Morony and J. O. Stewart building complex for experimental studies of earth blocks. Quail Run, Del Rio, Texas. Arrow: Mexican brown roof with an R-2 value based on 8-inches of soil. The control; lower roof elevation of conventional construction with an R-30 value roof insulation. Figure 4. Construction the Mexican green roof: Left: 2 x 12, emplaced on concrete bond beam with ¾ inch plywood decking. Center: Cinder blocks (CMUs) are used for parapets; gaps for canals. Right: Membrane, canals and soil emplaced. Figure 5. Room interior with the Mexican brown roof (no vegetation). Ceiling is also the decking;2x12 inch timber on bond beam noted by dashed line. Figure 6. Data comparisons of the conventional flat roof (top) and a Mexican brown roof (bottom) as illustrated in Fig. 3. Disregard the symbol for vegetation lacking at the time of the experiment. 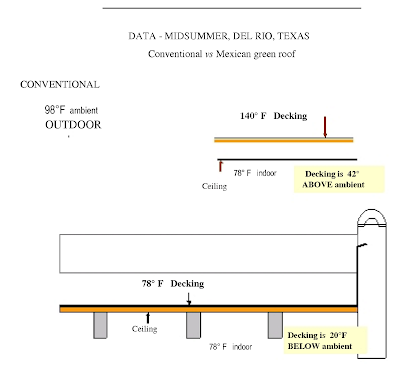 Both building had the same interior building temperatures of 78° F. With an outdoor ambient temperature of 98° F the decking of the conventional flat roof was 140° F or 42° F above ambient; the Mexican green roof had a deck temperature the same as the ceiling: 78° F or 20° below outdoor ambient. There is thus a 62° F difference the temperature of the two deck types. Why has the Mexican green roof prevailed for so long as vernacular architecture in Mexico? One may assume it was simply the recognition of the inherent advantages of soil on roof both as a heat barrier and durability as previously detailed for green roofs. Oddly, the Santa Fe “look” has been a prevailing consideration for building in New Mexico, at least in Santa Fe. It is a style that includes the flat Mexican roof but often without the incorporation of soil. When so constructed, it has been necessary to emplace roof insulation below the decking and adding significant complications to roof construction. The Mexican green roof shares the same advantages of the European green roof: the soil and plant life, if present, serve to protect the roof from the elements and greatly extends the life of the roof. Damage by fire or hale is greatly minimized or, for all practical purposes, eliminated. Something to think about on a hot Texas afternoon: John J. Morony shows how a breathable earth walls naturally cool themselves. Even New Mexico regulators don't understand adobe! The code they are pushing which incorporates HERS ratings and LEED standards would substantially upgrade the efficiency of inherently inefficient construction methods (stick building) but would cause problems for adobe and compressed earth block builders among others, since according to Joe adobe builders would not qualify for the NM Sustainable Building Tax Credit. This illustrates how complicated regulatory issues can become. Good luck to all the natural builders in New Mexico. A Nuclear Power Forum, hosted by San Antonio's Clean Tech Forum (SACTF)on September 16 from 11:30 am to 1:30 pm at the Pearl Brewery Stables will feature among others Dr. Patrick Moore who is an avid supporter of nuclear power. San Antonio Express-News editor, Bob Rivard will moderate the panel and the E-N will publish a series of articles focusing on the issue in the lead up to the conference. The Clean Tech Forum intends to partner with other organizations to create additional seminars on the 15th and 16th of September to take advantage of the presence of experts on the issues in San Antonio. UPDATE: August 12, 2009. It appears that speakers will also include Dr. Arjun Makhijani, author of Carbon-Free and Nuclear-Free: A Roadmap for U.S. Energy Policy among other works and Craig Severance, author of Business Risks and Costs of New Nuclear Power. San Anto Cultural Arts Offers "Westside Bike Ride con Murals"
Bring your ride and glide through the Westside with San Anto Cultural Arts (SACA) Co-founder Cruz Ortiz and Community Mural/Public Art Program Coordinator Ruth Buentello. Cruz and Ruth will conduct the tour through the back roads of the Westside’s museum of mural arts. San Anto Cultural Arts is rooted in the community and its murals tell rich narratives of cultura the Westside. Don’t miss the opportunity pick up some barrio art history and burn some calories at the same time. The mural bike tour will take you past 12 of SACA’s murals. Murals included in the tour will be Educación, a 1994 mural that became the vision and birth of the organization; La India (The Indian Woman), a mural about traditional curanderismo (Spanish for natural healing) with stained glass installations; and Lideres de La Comunidad (Spanish for Community Leaders), a vibrant tribute to Westside community leaders. Come be apart of our first mural bike tour. Cyclists of all levels and abilities are welcomed to join this bike tour. The tour will cover approximately 3.5 miles and will be conducted at a moderate pace. Participants are strongly encouraged to bring and wear their helmet. Participants will be asked to sign a liability release. Friday, July 17, 2009, 6:00 p.m. to 8:00 p.m. This event is being held to increase awareness of the numerous artistic contributions made by SACA over the years to the city’s Westside, to promote physical activity within the Westside community, and to raise funds for the continuation of SACA’s mission to promote human and community development through community based arts. For more information, please contact Community Mural /Public Art Program Coordinator Ruth Buentello at 210.226.7466 or via email at ruth@sananto.org. Elizabeth McGreevy , certified permaculture designer and MLA landscape architect is in the midst of taking a long detailed look at the negative stories put out about ashe juniper aka mountain cedar. She calls them tall tales. She's still working on a book on the subject but you can read excerpts that form an excellent outline on her website landsteward.net. Her chapters question the major anti-cedar statements that are repeated over and over again. She looks for what is true in the statements and what is exagerated or false. She looks at the study that is used to criticize cedar's water usage and finds its conclusions ill founded. She looks into statements that are passed on as fact regarding cedar's effect on other plants such as Live Oak and finds them to be incorrect. She points out that the presence of mountain cedar pollen in a cave in Bexar county indicates that it is a native plant contrary to what many say. She questions whether the entire hill country was grassland before European settlement and whether the natives were able to burn it all regularly. The bandwagon effect is when people tend to go along with what others are thinking or doing without taking the time to examine the merits of a particular idea. Instead, the instinct to herd is the overriding factor and people will believe or do things based solely on the idea that “everyone else” is doing the same thing. As the beliefs are passed along, the strength of the new belief system increases. Back in the days before I started writing this book, I was part of the cedar bandwagon. I would listen and nod my head in “understanding” whenever the media, elected officials, friends, co-workers or builders informed me with great authority the many reasons why all mountain cedars are bad. 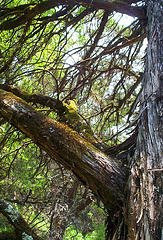 Some of the most popular reasons were that cedars are sucking water from our aquifers, they are not native, and they cause erosion. These beliefs then lead to new beliefs, and then more, with each new belief resting its weight upon the broadly accepted merits of the former. After reading this and beginning my research, I soon realized that although every argument against the mountain cedar seemed valid, none could hold up to close inspection. Almost no one I asked was able to provide concrete facts to support their claims. If evidence was shoved before me, my detective work usually found the evidence to be hogwash. Photo by gunnyrat published under creative commons. The main stadium built for the 2009 World Games (July 16 to 26) is the largest stadium to generate enough photovoltaics to power it completely. The stadium which seats 40,000 has 8,844 solar panels which will generate 1.1 million kWh per year. The World Games are the B-list of the Olympics. Only sports that don't make it into the big show can be included. These sports include korfball (a Dutch non-contact basketball like game), Tchoukball (another non-contact ball game), inline skate hockey, ten pin bowling and Pétanque, canoe polo and fistball (a one-bounce variation on volleyball). The solar cells lined up on the roof of the stadium were made by Lucky Power Technology LTD using equipment from 3S Swiss Solar Systems AG, Lyss. Timber framed buildings have many green building advantages. They are proven, having been the primary form of wood construction for centuries and they stand up for centuries too. There's lots of open space and the space between the posts can be well insulated without concern for bearing loads since the posts and beams do that. Since the frame is separate from the siding and insulation, both can be replaced as the building matures while the frame stays in place. To top it off, the interior space can be rearranged as well to meet changing needs. Stan Hegener of Sand Creek Post and Beam of Texas up in Bergheim is a Texas dealer for Sand Creek Post and Beam of Wayne, Nebraska. In Bergheim Stan occupies a visually stunning timber frame barn/office. 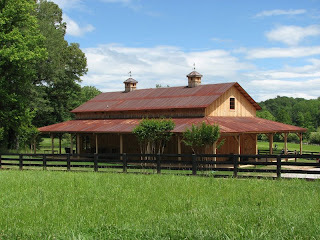 From there he sells timber frame barn and carriage house kits. Some 35 Sand Creek barn kits have been sold and built in Texas, including a barn workshop for the Kavanaugh ranch on Rebecca Creek near Spring Branch. Nationwide, the parent company has sold over 250 kits in 43 states since their founding five years ago. The vast majority of their customers are looking for a traditional barn but they are also popular as commercial spaces for craft businesses who want something brand new but timeless. The lumber is cut primarily from marked ponderosa pine in the Black Hills of South Dakota and never from clear cuts. For sill plates they use eastern red cedar. The lumber is full dimensional. The 6 by 6's are a full 6 inches by 6 inches. They never use treated wood, osb or plywood. The interior of the barns are entirely timber framed without joist hangers but for simplicity's sake the metal plates are used instead of mortise and tenons for joining the beams. Len Dickinson, co-owner of Sand Creek, has recognized the popularity of timber framing for straw bale enthusiasts and has sold several frames which were in-filled with bales. Texas Timber Frames on Camp Bullis Road in far north San Antonio is a related company run by Len's son, Jack Dickinson. Well it may not be completely old-fashioned but in this day and age it is close enough. Land Design is hosting an Old Fashioned Barn Raising in collaboration with Texas Timber Frames. The barn is being raised at 209 Red Oak Rd, Boerne TX. The hosts will be there from 10am-6pm Thursday, July 9 through Saturday, July 11. Food and drink will be provided. Timber Framing lends itself to many forms of green building by allowing infill with many different materials. It is also a mainstay of the residential open building methodology. Below is a video virtual tour of Texas Timber Frame's Eden house plan. Of course had you attended the March meeting of the San Antonio Sustainable Living group you would have heard all about SCIP's from Herb Nordmeyer. At our meeting Herb showed us pictures of one Galveston home, raised up on piers that still stood practically untouched while all the houses had been destroyed by Hurricane Ike. That one home had a floor, roof and walls made of SCIP's (Structural Concrete Insulated Panels). A handrail was destroyed and exposed pipes underneath had to be replaced but otherwise the home was intact. Its survival was not due to chance. Herb Nordmeyer knows concrete. He has spent his life learning the intricacies of pozzolans, additives which affect the properties of a particular batch of concrete. Fly ash is a pozzolan and Herb is one of the few who really understands its use. But since Hurricane Ike he has worked to educate code officials, homeowner groups and city officials understand that SCIP's are an economic building system that can prevent the kind of destruction caused not just by hurricanes but by the annual brush fires which plague California. A SCIP may be thought of a SIP (Structural Insulated Panel) that uses concrete instead of a wood on the outside of an insulated panel. There are many variations, some like wood SIP's are manufactured and cut to size in a factory, some have cement backer board attached to them, but Herb spoke to us primarily about the the MetRockSCIP style. These have a polystyrene core surrounded by a 3 D cage of rebar and clips which suspend the metal. The foam panels can be made to size on site. Once raised into place the metal is covered with cement stucco. Some designs allow the stucco to be pumped on, while others require troweling. When the interior and exterior stucco cures it provides the vertical and horizontal load-bearing that is provided by a sheet of plywood or OSB in a SIP. Because they have no wood, they are not vulnerable to termites. If SCIP's are used for the walls, floors and roof then the resulting building will be fireproof for all practical purposes. The walls perform at an equivalent R-40 with a sound rating (STC) of 50 or more, (even the floors). The buildings are inherently windstorm and hurricane proof and can easily be made earthquake proof. The metal and polystyrene in a SCIP can be from recycled sources and the concrete can include up to 50% fly ash (if correctly formulated by a fly ash expert such as Herb Nordmeyer). Costs are similar to 2 x 6 construction when built by a trained crew. Though "skilled labor" is not needed, experienced labor is required for the work to go a quickly as possible. Framers and drywallers are not needed though typically the interior and exterior is finished by a plasterer. Manufacturers include MetRock, Solarcrete, Green Sandwich, SIPCrete and ProTec. There's distributed small solar power as called for in Mayor Hardberger's Mission Verde in which solar power is added where feasible near to the place where it is consumed. Then there's big solar, such as the 27 MW project which City Public Service announced June 22, 2009. Nationally big solar is represented in the Grand Solar Plan as presented in the January 2008 issue of Scientific American. This plan called for massive solar power plants throughout the western US along with infrastructure which would allow 65% of electrical generation in the USA to come from Solar by the year 2050. On June 29, 2009 the Department of the Interior announced plans to evaluate more than 24 separate sites which together have the potential to generate 100,000 MW of power. Craig Severance of Energy Economy Online has an excellent analysis of the Dept of Interior announcement, the Grand Solar Plan and Western Renewable Energy Initiative. Thanks to Christine Chapa of Solar San Antonio for passing this information on. LAS VEGAS, Nevada – Under initiatives announced today by Secretary of the Interior Ken Salazar and U.S. Senator Harry Reid (D-NV), federal agencies will work with western leaders to designate tracts of U.S. public lands in the West as prime zones for utility-scale solar energy development, fund environmental studies, open new solar energy permitting offices and speed reviews of industry proposals. Under one initiative, 24 tracts of Bureau of Land Management-administered land located in six western states, known as Solar Energy Study Areas, would be fully evaluated for their environmental and resource suitability for large-scale solar energy production. The objective is to provide landscape-scale planning and zoning for solar projects on BLM lands in the West, allowing a more efficient process for permitting and siting responsible solar development. Those areas selected would be available for projects capable of producing 10 or more megawatts of electricity for distribution to customers through the transmission grid system. Companies that propose projects on that scale in areas already approved for this type of development would be eligible for priority processing. The BLM may also decide to use alternative competitive or non-competitive procedures in processing new solar applications for these areas. Secretary Salazar and Senator Reid also announced the opening of a new Interior renewable energy coordination office (RECO) in Nevada, the first of four, with the others located in Arizona, California, and Wyoming. The offices will help to expedite processing of the increased number of applications for renewable energy projects on U.S. lands. Currently BLM has received about 470 renewable energy project applications. Those include 158 active solar applications, covering 1.8 million acres, with a projected capacity to generate 97,000 megawatts of electricity. That’s enough to power 29 million homes, the equivalent of 29 percent of the nation’s household electrical consumption. The BLM will continue to process existing renewable energy applications, both within and outside of the solar energy study areas. Interior also is coordinating with states to expedite permitting for a number of solar power projects nearing approval. The BLM will begin site-specific environmental reviews for two major projects in Nevada that would have a combine capacity of more than 400 megawatts of electricity: the NextLight Silver State South array is planned to produce 267 megawatts; and the NextLight Silver State North would produce about 140 megawatts. Interior continues to work with the Western Governors Association to develop renewable energy zones and transmission corridors. The Solar Energy Study Areas, located in Nevada, Arizona, California, Colorado, New Mexico and Utah and outlined in maps to be published in the Federal Register Tuesday, encompass about 670,000 acres. Only lands with excellent solar resources, suitable slope, proximity to roads and transmission lines or designated corridors, and containing at least 2,000 acres of BLM-administered public lands were considered for solar energy study areas. Sensitive lands, wilderness and other high-conservation-value lands as well as lands with conflicting uses were excluded. As part of this initiative, the BLM will segregate the study areas from new mining claims and other actions initiated by third parties under public land laws. This temporary 2-year segregation will give BLM time to complete its environmental review and make a determination on solar energy zones. It will not affect rights established prior to the temporary segregation. The public will have the opportunity to comment on these proposed solar energy study areas during the environmental reviews before any final decisions are made. The evaluation is expected to be completed in late 2010. An ongoing federally-funded environmental evaluation of potential solar energy development on public lands in 6 Western States, known as the Solar Programmatic Environmental Impact Statement, or PEIS, will be expanded to include an in-depth analysis of the potential impacts of utility-scale solar energy development on public lands in the 24 Solar Energy Study Areas. This enhancement will be supported by additional federal funding under the American Recovery and Reinvestment Act. The BLM will continue to process the 158 active solar applications during preparation of the PEIS. The bureau will also continue to accept new applications both within and outside of the Solar Energy Study Areas. However, these applications will be subject to any decisions made from the Solar PEIS. This expanded evaluation, a collaborative effort with the Department of Energy, will allow the Bureau of Land Management to take a close look at each study area to determine where it makes sense to develop large-scale solar projects in an environmentally responsible way. Companies proposing solar energy projects in designated areas would be able to “tier” to this study, using it as part of their environmental impact studies for site-specific projects, which are required by the National Environmental Policy Act. On Saturday, July 18 Mitchell Lake Audubon Center presents architect Stephen Colley in a wet workshop they call "Stephen Colley Greens Your Home". Stephen will provide inspiring, often simple ways to live “green” right here in San Antonio. The workshop will focus on water and energy issues, such as efficiency and multiple usage, energy conservation, and water quality. Stephen Colley, AIA is technical coordinator for Build San Antonio Green, a pioneer of green architecture in San Antonio, an architect in private practice and the long time leader of San Antonio Sustainable Living. The San Antonio Business Journal has an excellent short article on the Mission Verde Parks plan from Bob Shemwell, of Overland Partners. The plan brings some of the work he and his firm have done around the country on water management to San Antonio. Be sure to follow the link to Five Minutes with Bob Shemwell - 'New Water Ideas". Thanks to Joe Barfield for passing on this March 20, 2009 article. At the San Antonio Clean Tech Forum in April, Joe says that Bob was calling the plan "Aqua Verde". So look out for that name as well. Please join the San Antonio – Bexar County Metropolitan Planning Organization’s Bicycle Mobility Advisory Committee (BMAC) for its second evening meeting of the year. We’d like to hear from cyclists. Then sit back and learn about current bike initiatives throughout the region. See what is in the works for the 3rd edition Bike Map and, last but not least, find out what the region has planned for the next 25 years as it relates to cycling. Doors open at 6:00 p.m. with light refreshments. The meeting begins at 6:30 p.m. In the Community Room of Via Metro Center (the former Kroger) at 1021 San Pedro. Keep San Antonio Beautiful is offering four 15 minute composting classes on Friday July 10 at their offices at 1940 Grandstand, San Antonio TX 78238. (It's in the Alamo Downs business park off of the access road inside Loop 410 north of Culebra. The classes are at 9:00 AM, 11:00 AM, 1:00 PM and 3:00 PM. No registration or RSVP is needed. Each attendee will receive a free Presto Hoop Compost Bin. I've had a similar bin for many years. It isn't heavy duty but it works fine. One website even recommends it be used as a vertical tower garden. Keep San Antonio Beautiful established in 1980 is an affiliate of Keep Texas Beautiful and Keep America Beautiful. They partner with government, industry and individuals in projects including Adopt-A-Spot Litter Control, Dial-A-Trailer, Basura Bash, Graffiti Wipeout, Green Team Challenge, Project Re-directory School Competition, and the Alamo Forest Partnership. If you make it out to one of the workshops and if you pay CPS for your garbage collection you might want to work in a visit to the San Antonio Household Hazardous Waste collection site nearby at 7030 Culebra Road. It is open on Fridays from 7:00 AM to 4:00 PM, and paid for through an addition to your CPS bill. Be sure to bring your CPS bill for identification. You could even drop off an analog television, or do your good deed for the day by helping out an apartment dweller who doesn't have access to the CPS HHW site and drop off their broken or unwanted TV . To address the severe drought conditions we are experiencing throughout the region, GEAA is mounting a campaign to give bragging rights to all of us who are pitching in to conserve water this summer. We have three versions of yard signs available for display in your front yard that announce, "I'm not watering - I'm sharing my water with local farmers, our Hill Country springs, or Whooping Cranes." GEAA members are aware of the need to maintain flows from the Comal and San Marcos springs to provide freshwater that Whooping Cranes (and river outfitters) rely upon for their livelihood. And, doesn't is just make sense that scarce water resources are better used on food crops than on carpet grass? With your help, we hope to encourage people to make the connection between suburban water usage and the health of our Edwards Aquifer ecosystem. We want to get these signs out in our neighborhoods as soon as possible - all over the Hill Country! Will you help us spread the message that we all need to share our water resources during the hot summer months? You can also order signs for $20 via GEAA's website ($5 extra for shipping). Please visit our online store to order your signs, or contact Elena at 210-320-1457 / Elena@AquiferAlliance.org to schedule a time for pick-up at the San Antonio office. We hope you get the chance to enjoy our spring-fed waterways and pools this summer. Please help us keep some water in our rivers by keeping it off lawns by purchasing a sign (or all three) for your yard today. They are an attractive way to proclaim that you care. We can get through this summer, but we need to do it together. Jason of OrganicTexas brought his camera and crew to the June meeting of San Antonio Sustainable Living at Whole Foods. The resulting video, divided in to YouTube compliant lengths has been posted to the web. Architect Stephen Colley, AIA talked to the group about adobe construction, clay finishes and building with Mason Greenstar papercrete blocks among other things. If you follow the OrganicTexas link to the San Antonio Sustainable Living playlist you can play all of the segments in order. Texas Governor Perry vetoed House Bill 821 the TV TakeBack Bill on June 19, 2009. According to the bill's backers he never gave indication that he opposed the bill during the time that legislators and citizens spent hundreds of hours working for its passage. According to the San Antonio Current, Representative David Leiebowitz takes the veto as a personal affront. Read the San Antonio Current article "Environment thrown to the wayside in favor of TVs"
Below is the complete text of Governor Perry's veto message followed by the analysis of the bill by the House Research Organization and the text of the bill as passed by both houses of the legislature. Although House Bill No. 821 attempts to make it easier for consumers to recycle old televisions, it does so at the expense of manufacturers, retailers and recyclers by imposing onerous new mandates, fees and regulations. House Bill No. 821 mandates that television manufacturers collect and recycle a quantity of televisions – regardless of the televisions’ original manufacturers – to be determined annually by the Texas Commission on Environmental Quality. It would also hold manufacturers responsible for recycling old televisions on the basis of their market share of new television sales, not on the basis of their past share of manufactured televisions. Additionally, the bill imposes new fees on both manufacturers and recyclers. These requirements would generate unfair results and stifle competition. The program established by this bill is significantly different from a program established by House Bill No. 2714 in the 80th Legislature for the recycling of computer equipment, which has been widely successful without distorting the marketplace. House Bill No. 2714 requires computer manufacturers to develop plans providing opportunities for consumers to easily return equipment to the manufacturer for recycling. Rather than mandating a program, it provides incentives to manufacturers for accepting equipment from other companies, and specifically prohibits imposing new fees on manufacturers, retailers and recyclers. Texas has repeatedly proven that wise incentives can accomplish environmental progress with far greater success than burdensome mandates, fees, regulations and extensive reporting requirements. Before mandating programs and regulations that entail new costs to the state, consumers and Texas employers, lawmakers should look to encouraging voluntary recycling programs like those being implemented by electronics retailers across the state. I recommend that the 82nd Legislature reconsider this issue to enhance the program for television recycling without hindering competitiveness and imposing burdensome fees and regulations. BACKGROUND: The 80th Legislature enacted HB 2714 by Bonnen, which established the computer equipment recycling program. This program requires manufacturers to accept computers back from consumers for recycling and imposes penalties against manufacturers who do not comply. DIGEST: CSHB 821 would set up a comprehensive program for the collection and recycling of television equipment for televisions sold or used by consumers in Texas. Texas Commission on Environmental Quality (TCEQ) would be required to adopt recycling standards based on the Electronics Recycling Operating Practices provided by the Institute of Scrap Recycling Industries or standards from a comparable nationally recognized organization. Manufacturers. The bill would require television manufacturers to pay a $2,500 annual fee and register with TCEQ before January 31 of every year. Registrations and renewals would be required to include contact information and a list of all brands a manufacturer used in this state, even if the manufacturer were not licensed or did not own a particular brand. Television manufacturers would be required to submit an annual report to TCEQ detailing the weight or amount of television equipment sold and recycled in the preceding year. CSHB 821 would require manufacturers to submit a recovery plan explaining whether a manufacturer intended to collect and recycle its market share of television equipment, individually or in partnership with other manufacturers, and collection methods that would avoid requiring a consumer to pay a fee at the time of recycling. The bill would prohibit manufacturers from selling unlabeled TVs. Retailers. CSHB 821 would prohibit retailers from selling TVs from manufacturers that had not registered with TCEQ. Retailers would also be required to provide consumers with information about the recycling program either by including it on the receipt or in packaging, or by a toll-free phone number and website. Recyclers. The bill would require recyclers to register annually with TCEQ and submit a report detailing the total weight of TV equipment recycled in the preceding year. The bill would allow TCEQ to impose a fee for recycler registration. Publicity. The bill would require TCEQ to publish a list of manufacturers participating in the program on its website. TCEQ would also be required to host or commission a third party to host another website that displayed a toll-free number for consumers to call to learn about the program and information about or links to manufacturer’s collection programs and sites. TCEQ would be required to provide local governments with information in writing about television recycling. TCEQ would be required to compute the state recycling rate and provide manufacturers with their market share allocation each year. TCEQ would not be authorized to charge recycling fees. The bill also would require TCEQ to submit an annual report to the Legislature detailing the program’s performance. Enforcement. The bill would authorize TCEQ, the attorney general, and the executive director to take appropriate action against television manufacturers, retailers, or recyclers who violated the rules of the recycling program. Violators would have 60 days to comply after a notice of violation was issued. Manufacturers who did not label their TV equipment would be assessed a penalty of not more than $10,000 for a second violation and not more than $25,000 for a subsequent violation. Other violations would be assessed a penalty of not more than $1,000 for the second violation and not more than $2,000 for each subsequent violation. The bill also would prohibit a person from disposing of television waste in a landfill or incinerator. Landfill owners or operators would not be in violation of the recycling program if they: made a good faith effort to comply, posted a sign prohibiting the acceptance of television waste; and notified collectors in writing that television equipment would not be accepted. Exemptions. The bill would exempt manufacturers, retailers, and recyclers from liability for information a consumer left behind on a television. Consumers would be responsible for any such information. The following types of electronic equipment would not be covered under the program: computers, parts of motor vehicles; industrial, governmental, commercial, research and development, medical, security, sensing, monitoring, antiterrorism, or emergency services equipment; devices in exercise equipment or appliances intended for home use; telephones; PDAs; global positioning systems; leased television equipment; or TVs that are part of a recycling contract between the manufacturer and the owner or renter. The bill would require state agencies to give preference to manufacturers that collected more than their share of TVs for recycling or provided collection sites in underserved areas. If a federal TV recycling law were to pass, TCEQ could adopt an agency statement interpreting federal law as preemptive of state law. The bill would require TCEQ to adopt rules for implementation by May 1, 2010. The bill could not be enforced until September 1, 2010. The bill would take effect September 1, 2009. CSHB 821 would prevent countless television sets from being disposed of in landfills, where they pose a threat to the environment and public health. Televisions are made of heavy metals, like mercury, that can seep into and contaminate drinking water systems. Landfills are overflowing with tons of consumer waste that would have been better disposed of through recycling. The bill would reduce the amount of toxic waste in the state’s landfills. As the nation transitions to digital television, the number of televisions that consumers are ready to dispose of is likely to surge. Consumers who had older televisions at the time of the digital transition would be able to take advantage of the recycling program established by the bill. CSHB 821 would establish a timely new program that could make a tremendous difference if enacted before the digital transition. Many consumers currently drop non-working television sets off at non-profit organizations in an attempt to give them away. Goodwill and similar organizations cannot handle all of the non-working televisions they receive. Charities are forced to spend thousands of dollars on the disposal of televisions dropped off at their doorsteps, when this should be the responsibility of the manufacturer. HB 821 appropriately would take the financial burden of recycling televisions off of the non-profits and transfer this responsibility to the manufacturer. The bill would not unduly harm manufacturers. Many companies already take back televisions for recycling, and HB 821 would affect only the companies who have yet to adopt television recycling programs. Also, television take-back provisions in the bill would apply to manufacturers in proportion to their share of the television market, so small businesses would be responsible for recycling only a small percentage of the market. Television manufacturers do not need government intervention to set up recycling programs. Companies that can afford to do so already have set up comprehensive recycling programs. Smaller businesses, on the other hand, may not have the resources to afford to recycle used televisions. Because many manufacturers no longer are in operation, existing manufacturers would be unfairly burdened with recycling products that they did not produce. CSHB 821 would interfere with the free market mechanisms at work in the television manufacturing business. The companion bill, HB 761 by Carona, was left pending in the Senate Natural Resources Committee on April 14. The fiscal note estimates that the bill’s $2,500 registration fee would result in $127,500 deposited in general revenue each year. computer that contains a television tuner. recycling, as computed by the commission under Section 361.981(g). broadcast, cable, or satellite source. among consumers, retailers, and the government of this state. equipment that has reached the end of its useful life. equipment has been labeled in compliance with Section 361.975. Sec. 361.976. MANUFACTURERS' REGISTRATION AND REPORTING. the commission as the manufacturer's market share allocation. combined market share allocations of the group's participants. with the sales receipt or as part of the packaging of the equipment. an Internet website provided to consumers. covered television equipment for recycling. in the preceding 12 months. collection and recycling of covered television equipment. this state during the preceding year. must be provided in writing. and rules adopted under this subchapter. date the warning notice is issued. than the 60th day after the date the warning notice is issued. Sec. 361.983. FINANCIAL AND PROPRIETARY INFORMATION. not later than March 1 of each year. legislature in evaluating the effectiveness of this subchapter. used by the commission only to implement this subchapter. with federal, state, and local law. must be in compliance with this subchapter. accept the prospective bidder's bid. interprets the federal law as preemptive of this subchapter. issues a statement under this section. later than May 1, 2010. (b) This Act may not be enforced before September 1, 2010.
before the effective date of this Act without incurring a penalty. implementing this Act take effect. SECTION 4. This Act takes effect September 1, 2009. 27, 2009, by the following vote: Yeas 31, Nays 0.